Microbes...you gotta see this one !!! Re: Microbes...you gotta see this one !!! @has55 wrote: that's good healthy fungi. I have to find the ratio per view chart to tell what a good ratio for each organism. If I find it, I will post it. Using a microscope, assess the compost: using a 1:5 dilution of compost, 400x total magnification, there should be a minimum of thousands of bacteria in each field of view, 1 strand of fungal hyphae in each 5 fields, 1 flagellate or amoebae in each 5 to 10 fields of view and 1 beneficial nematode per drop. @has55 wrote: Using a microscope, assess the compost: using a 1:5 dilution of compost, 400x total magnification, there should be a minimum of thousands of bacteria in each field of view, 1 strand of fungal hyphae in each 5 fields, 1 flagellate or amoebae in each 5 to 10 fields of view and 1 beneficial nematode per drop. It will be interesting to see the microbe count/activity in the firest batch of compost from the compost tumbler this spring. I don't expect to see much fungal hyphae or nematodes due to the closed environment of the compost tumbler - it is pretty much a closed environment - but, it should be very heavy with microbes. In a couple weeks I will be making the first batch of Actively Activated Compost Tea to use in charging some Biochar, and plan on testing that at various times, i.e., 12-hour, 24-hour, 36-hour, to compare the microbe activity. That should be a good learning process. 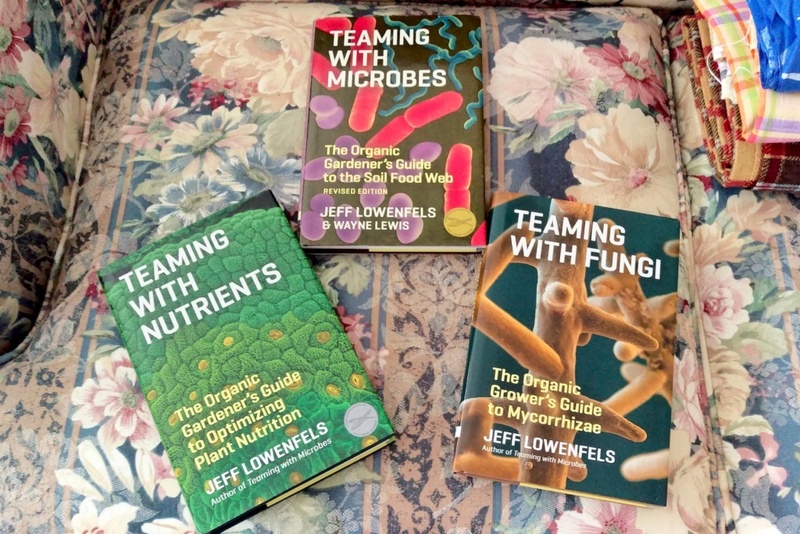 The Trilogy of Organic Gardening books.....I now have the full set. Good for you, Ohio Gardener. You can make up a batch of fungi to add to the tea at the very end. I believe the section on tea in the Microbes book explains how. I added a bit of compost, to a closed container, then a bit of oatmeal, a couple pieces of fruits. etc. closed the container, then placed in a couple brown bags, stored in a dark section,you want no light getting into container... closet would be good. relatively warm temps and in a few days you will see the mycelia developing. quite interesting. Jimmy Cee, so good to hear from you. How long do you brew the fungi after you add it to the compost tea? How much did you make to add to the tea? @has55 wrote: Jimmy Cee, so good to hear from you. How long do you brew the fungi after you add it to the compost tea? How much did you make to add to the tea? Here is one I saved showing difference in size...back ground sprayed with compost tea.....foreground sprayed with nothing.....4 day period...amazing ...huh ? @jimmy cee wrote: Here is one I saved showing difference in size...back ground sprayed with compost tea.....foreground sprayed with nothing.....4 day period...amazing ...huh ? Yes, yes it is! 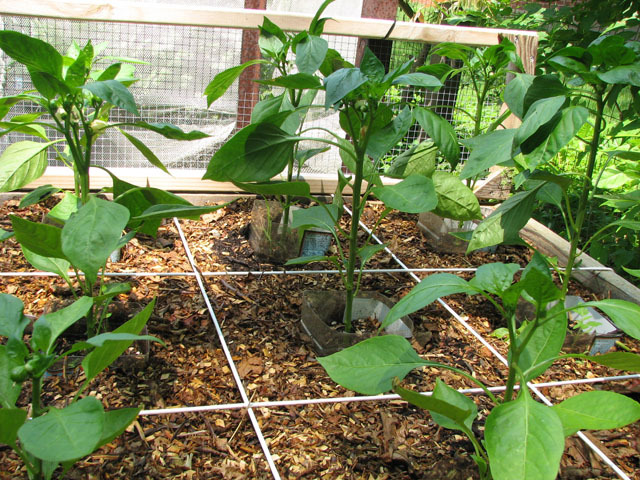 But, it is very similar to what I have seen after starting to spray high quality compost tea on the plants. Another amazing thing to me was that the plants that were sprayed had virtually no insects - I don't know if it was because the spray prevented the insects, or if it was because the plants were so healthy that the insects weren't interested in them. I am looking forward to monitoring the tea under the microscope this year to see how active it is at the time it is sprayed. Thanks for posting this, Jimmy! Thank you Professor Jimmy Cee. Question, going back over the time to add the fungi to the tea, when did you add it and how long did you allow it to brew, esp since the mycelium is fragile in rough water? Is the purpose to get the fungi to separate from the feed mix, then spray or to separate it and get it to grow in the tea, then spray? @has55 wrote: Thank you Professor Jimmy Cee. Question, going back over the time to add the fungi to the tea, when did you add it and how long did you allow it to brew, esp since the mycelium is fragile in rough water? Is the purpose to get the fungi to separate from the feed mix, then spray or to separate it and get it to grow in the tea, then spray? I just do not know and never went far enough to find out.. Description was to add at the end of the cycle. I think I added it to the can a few minutes before it ended. Used an open spray can to just drench the soil. I made so much I used it all the time, one can never have or use to much. OG this may be helpful. KIS ORGANICS has 12 videos of old microscopy research done 1-2 yrs ago. It's a cannabis channel, but still, good info to glean some experience. Go to the bottom of the page to the 1st video. This is KIS organics using the microbulator. Last summer the Living Web Farms did a 5-part video series, titled "Assessing Soil Health Using a Microscope", that did a great job of teaching the types of microbes, the desired ratios of them, etc. I have referred back to the videos several times to pick up things I missed or wanted to review again. Made a 15-gallon batch of Actively Aerated Compost Tea (AACT) to use for inoculating 2Ft3 of Biochar to add to two different raised beds. I did two different microscope analysis of the compost tea - once at 16 hours, and once at 24 hours - and, and was happy with the microbial activity I saw. Many active bacterial, a lot of hyphae, some flagellates, and a couple amoeba. I was surprised that the microbial activity at 16 hours was nearly as great as it was at 24 hours (Note: I had planned to test at 12 hours, but since I started it at 4:00pm the 4am test was delayed for a few hours due to sleep desires). So, it may not be necessary to brew for 24 to 36 hours to get good compost tea. I will continue monitoring with the scope for future brewing to see if this is always the case. This is the first time I made tea using a thermostatically controlled heater to ensure the microbes had ideal temperature to multiply, so that may have been part of the difference. This has been a great learning experience, and hopefully will lead to continued improvement for the gardens. The microscope has been a great tool in this endeavor. Here is a short video of the microbial activity in the compost tea at the 24-hour point, viewed at 400X on the microscope. This morning while checking out a new batch of Compost Tea, I found this most interesting critter among all of the bacteria. Not sure what it is, but it was fascinating to watch. Still trying to identify it, though. @OhioGardener wrote: This morning while checking out a new batch of Compost Tea, I found this most interesting critter among all of the bacteria. Not sure what it is, but it was fascinating to watch. Still trying to identify it, though. Thanks to Mr. Tim Wilson, author of Microbe Organics, for his note identifying this as a Testate Amoeba, which allowed me to then go to the Microworld - world of amoeboid organisms site to learn more about it. Continually learning more and more about the Soil Food Web!